ArtCan’s pop up exhibition in partnership with Lumen London and St John on Bethnal Green celebrating the connection between art and science. 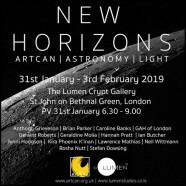 Lumen London is an arts collective specializing in exhibitions and events centred around astronomy, physics, broader aspects of science and ecology. “New Horizons” explores the exciting intersection between art and science and how these seemingly opposite subject matters can influence and create a positive collaboration with each other. Artists participating in this show are exhibiting work inspired by contemporary scientific research including astronomy, light, speculative ecology and nature.